For most toddlers, preschool is their first experience being away from their parents for a long period of time. We need to keep in mind that children who come to school from this age are still learning to talk. At the beginning, many children experience separation anxiety so it is our job to make sure they feel comfortable and safe in their new surroundings. As kids settle in they learn to greet teachers and one- another. We encourage this positive social behavior and open communication. Preschoolers also start to gather together during circle times to build vocabulary, learn songs and play with numbers. Once the children are familiar with their new friends and teachers, they will learn how to use the toilet properly. As the kids develop new listening skills they will be able to move around the classroom in an independent way when it is appropriate. The children start to understand the difference between `time to listen` and `time to play` so during this stage of their development they will be more adept at paying attention, speaking and listening. Lessons at this stage will incorporate alphabet and numeral play too. Also throughout this stage we emphasize table manners including how to use utensils properly and how to clean up. 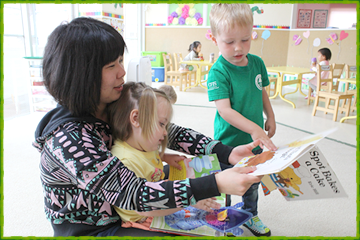 By the end of the year, preschoolers will be able to follow the daily routine and listen to the teachers' instructions. They will also be able to go to the toilet by themselves. As preschoolers become independent they become more creative too. We give them many chances to express themselves through language, math play and all kinds of craft endeavors. 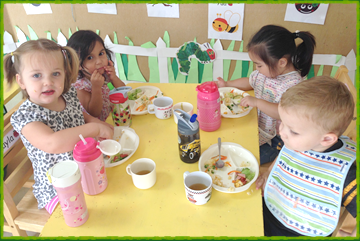 By this stage, preschoolers can communicate well, they can express their opinions and carry out all manner of conversations. The children are now ready for K3.